Usually, your first magazine will start arriving within six to eight weeks after we receive your order, but it does depend on the frequency of the magazine you've chosen and what part of the country it is being shipped to. Bi-weeklies and monthlies take approximately six to ten weeks to start. If the magazine publishes bi-monthly or quarterly, receipt of your first issue may take as long as ten to twelve weeks to start. All orders are fully cancelable as long as the cancel request is received within 48 hours of the time the order is placed. After that, in most cases cancellations will not be accepted. There's a good reason for this policy. All orders are pre-paid to the publishers and processed promptly so as to ensure that the subscription begins as quickly as possible. 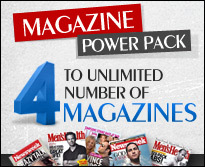 ReceptionMagazines.com differs from other online subscription services in that we never offer free trials or scams. We are authorized sub-agents who sell subscriptions for the lowest rates available by pledging that we will only process legitimate, pre-paid orders from consumers who are sure of what they want when placing orders. This saves time and money for all parties. It seems to work well. Unlike some of our competitors who cancel as much as 50% of all the orders they process, fewer than 1/5 of 1% of all ReceptionMagazines.com customers have requested refunds or cancellation since our online launch. We do recognize that special situations may arise when an inappropriate magazine is ordered or editorial content changes. In such an event, please contact us by clicking here: https://www.receptionmagazines.com/contact.jsp. All such cases will be handled on an individual, case-by-case basis.